The balcony harvest up to now has mostly been a couple goya from the green curtain, and a few sprigs of parsley, basil, and bergamont. The tsuru murasaki is also doing surprisingly well in it's container (thanks to Cafe Hatake! ), and we've been enjoying that in salads with the herbs, too. 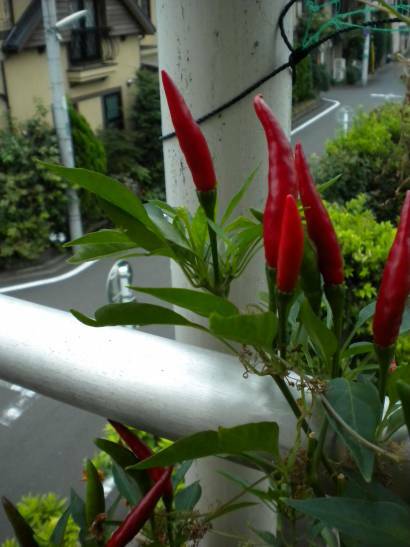 Adding a bit of color and spice (quite literally) to this bevy of treats are the two togarashi (hot pepper) plants. (You'll remember them as home to a praying mantis that munched on my aphids.) I came home from our trip to Hokkaido to find these lovelies waiting for me, and as we prepare to head out for a biking trip (our first!) a handful of others are ripening nicely. Those are so nice and yummy looking. I'm sorry to hear that, Fer! I'll happily share, if I can. What's banana fertilizer? banana fertilizer is a home made fertilizer that i made with banana peals, some extra soil and water from washing rice. I had made it originally for my roses because they didn't bloom but i had some left over and i used on the peppers.I think it was an overcharge or potash because they started to bloom like crazy, but they where to many flowers and no fruit. Wow. It almost sounds delicious! Where did you find the recipe or figure it out? You should do a write up on your blog and then offer it up to the folks at TokyoDIYGardening. We eat loads of bananas, so I'd love to know the recipe, too.